CHICAGO — Cam Ward made 30 saves in his first start since Corey Crawford was sidelined by a concussion, helping the Chicago Blackhawks top the Nashville Predators 2-1 on Tuesday night. Defencemen Gustav Forsling and Erik Gustafsson scored for last-place Chicago, which had dropped 10 of 11. 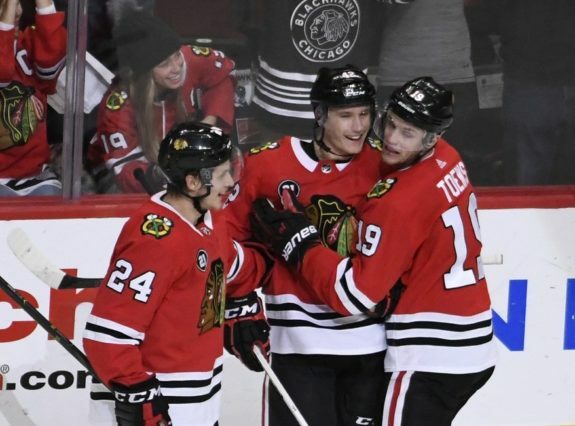 Patrick Kane picked up an assist on Gustafsson’s tiebreaking goal in the second period, giving him at least one point in seven of his last eight games. Ward was terrific in the Blackhawks’ first game since Crawford was placed on injured reserve after sustaining a concussion for the second straight season. The two-time All-Star got hurt in the first period of Sunday’s 7-3 loss to San Jose when the back of his head struck the right post during a scary goalmouth pileup. Kevin Fiala scored for the Predators, who dropped to 0-6-2 in their last eight road games. Pekka Rinne had 34 stops. Coming off a 4-3 overtime loss at Ottawa on Monday night, Nashville jumped in front late in the first period. Kane turned the puck over near the blue line and Fiala beat Ward with a well-placed wrist shot on the goaltender’s stick side. Chicago bounced back nicely in the second, outshooting Nashville 16-7 in one of its best periods in a while. Rinne made solid stops on Dominik Kahun, David Kampf and Kane before the Blackhawks went ahead to stay with a pair of goals 1:54 apart. Forsling tied it at 1 with a shot off the left post at 15:22. It was the second goal of the season for Forsling, who returned to the lineup after missing six games with a shoulder injury. After Predators forward Rocco Grimaldi was sent off for tripping Brent Seabrook, Gustafsson beat Rinne with a long slap shot for his seventh goal at 17:16. It was just the 13th power-play goal for the league’s worst team with the man advantage. The Blackhawks lost forward Marcus Kruger with 3:29 left in the period when he got hit in the face by an inadvertent elbow from Nashville’s Ryan Hartman. Kruger crawled on the ice for a bit before he made it to the bench and then went back to the locker room. NOTES: Nashville dropped to 17-2-0 this season when it scores the first goal. … Blackhawks C Artem Anisimov also returned to the lineup after being activated from IR. He had been sidelined by a concussion. … Rinne made his NHL debut and got his first career victory on Dec. 15, 2005, against Chicago. … Blackhawks D Henri Jokiharju will play for Finland in the upcoming world junior championship. The competition runs from Dec. 26 to Jan. 5 in Vancouver, British Columbia. … Blackhawks F Alex DeBrincat celebrated his 21st birthday. Predators: Visit Philadelphia on Thursday night. Blackhawks: Visit Dallas on Thursday night.